10 A None No Power Seat 10 A is a standard Economy Class seat that has restricted legroom. 10 C None No Power Seat 10 C is a standard Economy Class seat that has restricted legroom. 10 D None No Power Seat 10 D is a standard Economy Class seat that has restricted legroom. 10 E None No Power Seat 10 E is a standard Economy Class seat that has restricted legroom. 10 G None No Power Seat 10 G is a standard Economy Class seat that has restricted legroom. 10 H None No Power Seat 10 H is a standard Economy Class seat that has restricted legroom. 10 K None No Power Seat 10 K is a standard Economy Class seat that has restricted legroom. 14 A None No Power Seat 14 A is a standard Economy Class seat that is missing a window. 14 K None No Power Seat 14 K is a standard Economy Class seat that is missing a window. 22 A None No Power Seat 22 A is a standard Economy Class seat that may have limited recline. The proximity to the lavatories and galley may be bothersome. 22 C None No Power Seat 22 C is a standard Economy Class seat that may have limited recline. The proximity to the lavatories and galley may be bothersome. 22 D None No Power Seat 22 D is a standard Economy Class seat that may have limited recline. The proximity to the lavatories and galley may be bothersome. 22 E None No Power Seat 22 E is a standard Economy Class seat that may have limited recline. The proximity to the lavatories and galley may be bothersome. 22 G None No Power Seat 22 G is a standard Economy Class seat that may have limited recline. The proximity to the lavatories and galley may be bothersome. 22 H None No Power Seat 22 H is a standard Economy Class seat that may have limited recline. The proximity to the lavatories and galley may be bothersome. 22 K None No Power Seat 22 K is a standard Economy Class seat that may have limited recline. The proximity to the lavatories and galley may be bothersome. 23 A None No Power Seat 23 A is a standard Economy Class seat that has extra legroom due to the exit in front. The proximity to the lavatories and galley may be bothersome. 23 C None No Power Seat 23 C is a standard Economy Class seat that has extra legroom due to the exit in front. The proximity to the lavatories and galley may be bothersome. 23 H None No Power Seat 23 H is a standard Economy Class seat that has extra legroom due to the exit in front. The proximity to the lavatories and galley may be bothersome. 23 K None No Power Seat 23 K is a standard Economy Class seat that has extra legroom due to the exit in front. The proximity to the lavatories and galley may be bothersome. 24 D None No Power Seat 24 D is a standard Economy Class seat that has slightly restricted legroom. 24 E None No Power Seat 24 E is a standard Economy Class seat that has slightly restricted legroom. 24 G None No Power Seat 24 G is a standard Economy Class seat that has slightly restricted legroom. 43 C None No Power Seat 43 C is a standard Economy Class seat however, the proximity to the lavatories may be bothersome. 43 D None No Power Seat 43 D is a standard Economy Class seat however, the proximity to the lavatories may be bothersome. 43 G None No Power Seat 43 G is a standard Economy Class seat however, the proximity to the lavatories may be bothersome. 43 H None No Power Seat 43 H is a standard Economy Class seat however, the proximity to the lavatories may be bothersome. 44 A None No Power Seat 44 A is a standard Economy Class seat that has limited recline. The proximity to the lavatories may be bothersome. 44 C None No Power Seat 44 C is a standard Economy Class seat that has limited recline. The proximity to the lavatories may be bothersome. 44 D None No Power Seat 44 D is a standard Economy Class seat that has limited recline. The proximity to the lavatories may be bothersome. 44 E None No Power Seat 44 E is a standard Economy Class seat that has limited recline. The proximity to the lavatories may be bothersome. 44 G None No Power Seat 44 G is a standard Economy Class seat that has limited recline. The proximity to the lavatories may be bothersome. 44 H None No Power Seat 44 H is a standard Economy Class seat that has limited recline. The proximity to the lavatories may be bothersome. 44 K None No Power Seat 44 K is a standard Economy Class seat that has limited recline. The proximity to the lavatories may be bothersome. Each Business class seat is equipped with Audio Video On Demand (AVOD). All Economy class seats are equipped with audio entertainment. Each Business class seat is equipped with Audio Video On Demand (AVOD) featuring 15.4 inch touchscreen monitors. Overhead TVs screens are located throughout Economy class. 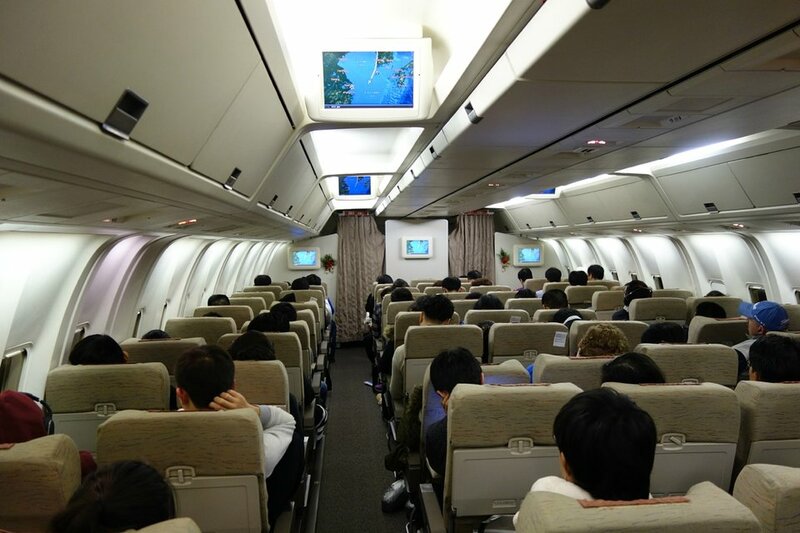 This version of Asiana's 767-300 is outfit in a two cabin configuration with Business class and Travel class seating, totaling a capacity of 250 passengers. The 767-300 is optimized for mid-to-long haul routes. The missing window is really between row 14 and 15, so it ends up being where your shoulder is on row 14. This can be a really bad thing if you have wide shoulders and normally lean into the window space, as it's a very flat wall here. This is an old and rather manky plane in general with no entertainment, low seat backs and very average space in general. Asiana flies 1 versions of Boeing 767-300.